Fair digital services must be identifiable and people want to have the power to decide who gets to use the data collected on them, and for what purposes. These are the views held by people in four European countries, according to a recent survey. Kantar TNS Oy conducted the survey in November and December 2018 in Finland, the Netherlands, France and Germany. More than 8,000 respondents took part, with about 2,000 people represented in each country. A summary of the results and the full set of research data are provided below. See all research material here. Overall, more than half of the respondents (58%) believe they have the right to know how, and for what purpose, their personal data is processed, to have access to their personal data collected by a service provider (58%) and to have the data collected on them erased (54%). 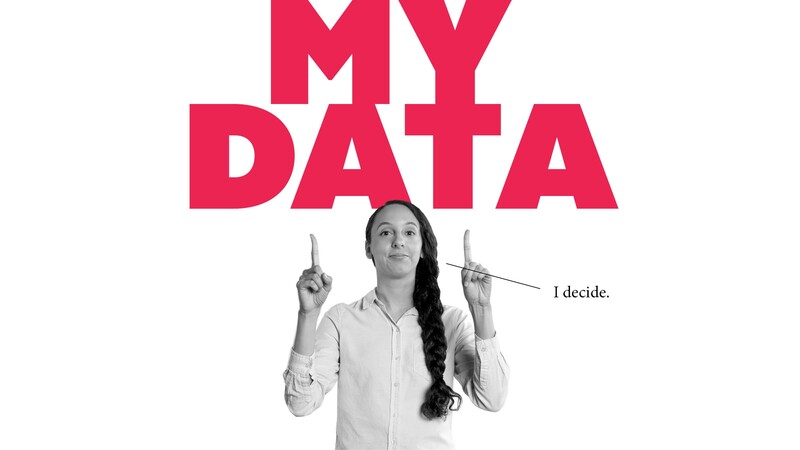 The right that the respondents believe in the least is the right to data portability, which refers to transferring the data collected by a service provider about individuals from one system to another (21%). Roughly one in three respondents think they have the right to receive a notification from a service provider when it sells or discloses their data to a third party. This is not, however, the case. Data is disclosed to third parties without any notification. Overall, more than a third of the respondents (36%) indicate that the introduction of the GDPR (General Data Protection Regulation) has not affected their behaviour in any way. Only one in ten respondents have requested access to their data. Slightly more than one in ten (12%) report having denied a service provider the right to automatically process their data. Some 42% of the respondents fully agree or agree that a lack of trust in service providers keeps them from using digital services. The proportion of the respondents who held this view was the highest in Germany (48%) and the lowest in the Netherlands (38%). Overall, 27% of the respondents report having changed privacy settings for some services because of data leaks in applications or services. However, 30% indicate having been unaffected by such news. Some 24% of all respondents report having reduced their use of some services. The corresponding figure was the highest in Germany (27%) and the lowest in the Netherlands and France (22%). The proportion of respondents who have stopped using some services was the highest in Germany (19%) and the lowest in Finland (11%). Opinions were divided regarding the effect of the surveyed issues on increasing trust towards service providers. The respondents felt that trust increases the most when users can accept or deny the sale of their personal data to third parties or erase the data that a service provider has collected on them. Even on these issues, one in three respondents (33%) indicate that trust increases to a fairly small degree or not at all. By and large, the trust-increasing effect of the various factors is seen as being the highest in Finland and the lowest in the Netherlands and France. A small majority of the respondents (59%) are of the opinion that the best way to give a service provider consent to have data on them collected and processed is for the user to give consent separately to each service provider. This alternative was particularly popular among Finns (74%) and the least popular in the Netherlands (47%). It is worth noting that in Germany, the Netherlands and France the proportion of survey participants who were unable to express a view on this issue was nearly a fifth – or more than a fifth – of the respondents. Giving consent separately to each service provider was also a more popular option the older the respondent. 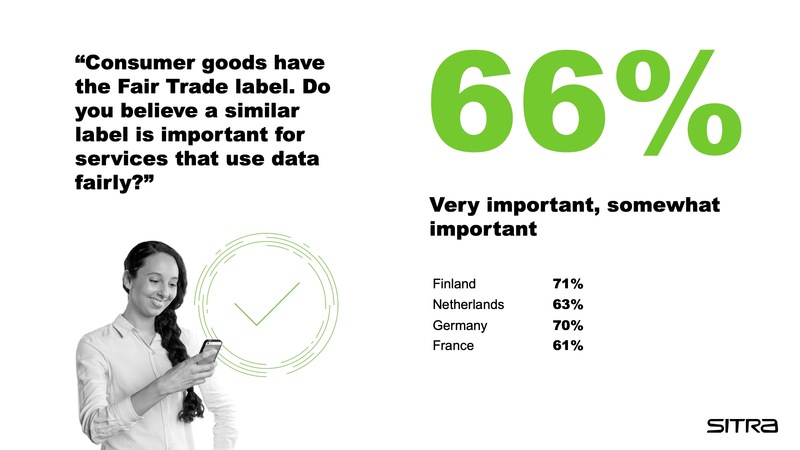 A label indicating the fair use of data is considered important (very important or fairly important) by 66% of all respondents. There were no major differences between the countries in this regard. Slightly more than one fifth (21%) of the respondents did not consider such a label to be important (not very important or not important at all). This figure was higher in France (26%) than the other countries. 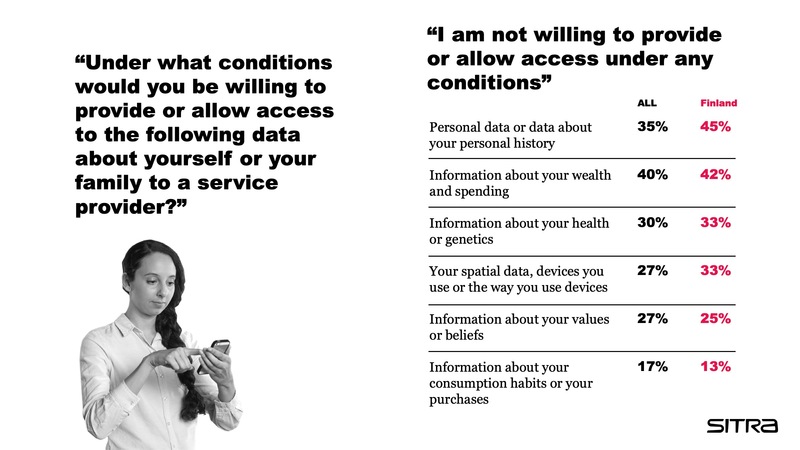 People are willing to give access to their data on consumption and purchases if they are offered additional services or a personalised service or are paid for the data. Finns, in particular, are willing to give access to information about their health and genetic make-up if the data is used for scientific research and purposes that are in the public interest. People are not eager to give access to personal data and information about their wealth. The survey was conducted as part of Sitra’s IHAN® project, which lays the foundations for a fair data economy and will create international rules and solutions for the fair exchange and use of data.